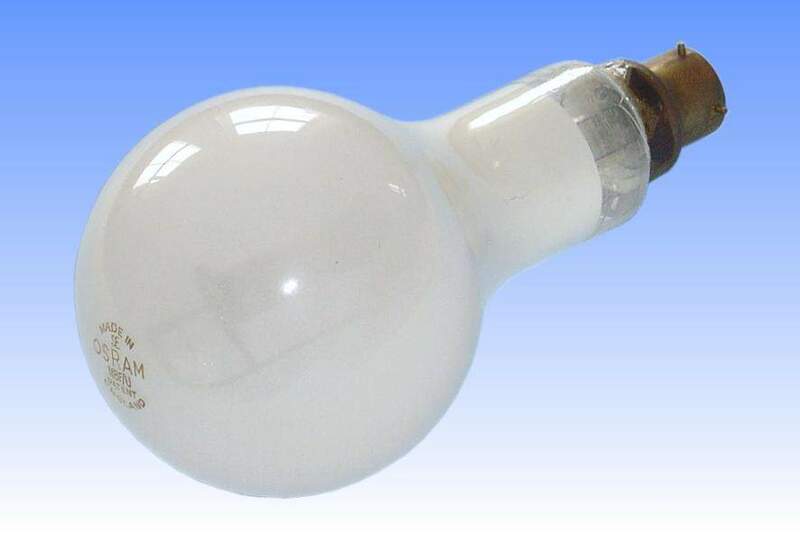 Osram-GEC played a very important role in the development of the mercury fluorescent lamp and made numerous contributions to the phosphor materials employed. In fact the halophosphate chemicals, still widely used in today's standard fluoresent lamps, were developed by a team at the GEC's Hirst Research Centre in Wembley, North London. 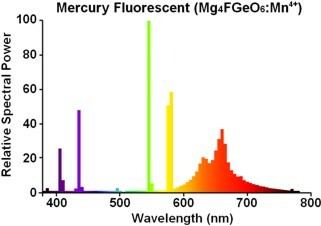 This particular lamp may be classified as being from the second generation of mercury fluorescent products, as it employs the magnesium fluoro-germanate phosphor. The first generation fluorescent lamps were MAF types, which have have hard glass arc tubes and the 365.5nm mercury line is the shortest wavelength available to activate a phosphor. Coatings of zinc and cadmium sulphides were the standard materials, and are easily recognisable because of the yellow colour of the coating. In fact the zinc sulphide coating absorbed so much blue light that it was standard practice to add a little cadmium to the arc tube to generate extra blue lines, as well as few weak red lines as well. The phosphor boosted radiation in the orange and red regions. MBF lamps however make use of quartz arc tubes, which transmit much shorter wavelengths of UV radiation. Magnesium fluoro-germanate was introduced with these products, a phosphor producing a brilliant red radiation at 658nm. Being a yellowish coating though, the blue mercury lines are absorbed somewhat, leading to an overall greenish cast from these lamps. Manganese-activated magnesium fluoro-germanate was superseded by europium-activated yttrium vanadate in the late 1960's which is neutral in colour and allows transmission of all mercury lines, and for deluxe colour lamps yttrium borate appeared in the 1970's.